Rate this Article The massive boom of the VR gaming industry has called a lot of attention to China. VR has never been so popular in any other part of the world, but as to whether the country can sustain its massive growth, let’s take a look. China is a big country with an equally large population and a very strong able body workforce. The consumer market in China is quite huge as to rival that of the west; the US and Europe. China is also very good in mass producing electronics at a much cheaper cost and price and exporting it all over the world. In fact, the country’s economy is rising at such a rate that it might probably soon overtake the west. This brings us to the reason why China can and already is leading the market in the Virtual Reality industry. VR has become so popular in China in such a proportion that will not be found in any other part of the world. The entire country has embraced VR and the business sector is heavily investing in the technology and the future that it will bring. According to several research firms who currently monitor the VR industry in China, the country’s market size for VR hardware has alredy reached $300 Million in 2016. Also, shipments of VR devices had reached around 300,000 units by the end of the third quarter of the same year. China’s estimated VR market will reach around $8.6 Billion per year by 2020. Bolstering up these figures are the continual heavy investments into VR hardware by big corporate players as well as the widespread deployment of VR infrastructure as compared to the rest of the world. In the past 2 years, thousands of internet cafes and arcade centers dedicated to VR have mushroomed all over the country where people go to play games and experience VR in general. Along with the bigger arcades found in shopping malls and commercial centers, this places where tagged as VR Experience Zones. The availability of ready equipment to use and the interest of the people to try out the new technology contributed the most to their popularity. 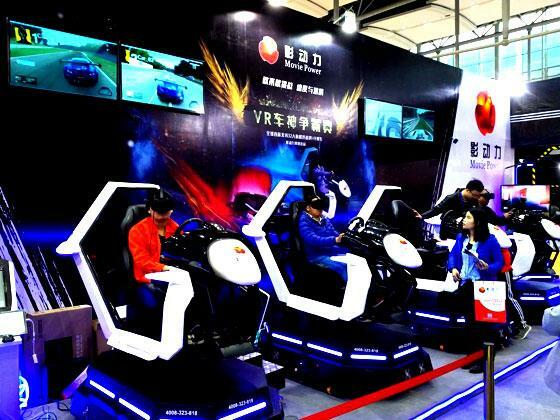 China’s entertainment sector which includes the world's largest digital games market is currently the major focal point of growth of the country’s VR industry. Tencent is one of China’s biggest internet companies and is known to be the world's top digital games maker in terms of quantity. They even develop games for the Oculus Rift. The company is currently backing up Original Force which is developing VR movies for Tencent Pictures. Likewise, Baidu, China's foremost search engine company (which is sort of the counterpart of Google) is investing heavily into VR tech.. iQiyi, Baidu's streaming subsidiary is developing the world’s largest Chinese VR content platform. The company has partnered with China's hardware VR manufacturers for a targeted sale of around 10 million VR headsets and VR mobile devices for the mainland alone that will support the platform with a planned inclusion of around 100 free VR games as well as Free VR movies. VR arcades are the most popular sources of VR gaming experiences where users of VR can find the space as well as the devices that enhance the VR experience. Several VR game development companies are focusing on the design and manufacture of VR headset and arcade rides that provide motion as well as vision which is said to reduce the effects of disorientation within VR that happens when one moves inside but is physically inert in the real world. Due to the popularity of the VR market, the country’s entertainment and communications industry is targeting nation wide live VR streaming and broadcasting as the next big thing in China. Currently however, the VR industry in China is relying on VR gaming as the main source for its earnings. The VR market in general has to overcome certain obstacles in order to achieve stability and a strong continual growth. China’s VR industry is extremely mass market based and the speed at which VR internet cafes and Experience zones have mushroomed was a little to fast that smaller scale VR businesses found it more difficult to keep up and started struggling to make a viable profit. In the 2nd half of 2016, a lot of VR hardware start-up operations went under as big tech manufacturers entered the Chinese market. Companies like Samsung, Sony and Microsoft as well as the big Chinese brands like HTC, Xiaomi, LeEco, Hauwei and Lenovo joined the VR hardware manufacturing industry. Investments for the VR hardware manufacturing star-ups went down but continue to remain positive for those specializing in VR content development like in VR games. High quality VR content in China remains in short supply as it is very costly to develop these. They would cost 2 to 3 times more compared to regular video content. Also, Small scale VR zone operations in China are finding it more and more difficult to compete with the larger ones located in Malls and commercial centers, but the attraction of experiencing VR in a quant and novel environment remains. The deciding factor however is price as small VR cafes cannot charge rates that woul be equal to those used for the larger well equipped VR centers. As they have to charge as low as 1.50 USD for around 30 minutes of VR time just to attract customers, they barely make any profit from sales. Even the VR arcades are finding it more and more difficult to compete with the larger ones. Of the estimated 35,000 VR arcades that mushroomed all over China in the last 2 years, only around half are still currently in operation today. The competition has become intense that big operations are pushing out the smaller ones just like what happened in the headset manufacturing sector where almost 90% of the original start-ups have already folded up. Make no mistake, VR arcades are very popular in China and so is VR, but the grim reality of cost still somewhat hang as a dark cloud in running and maintaining the high quality VR Experience Zones with its wide array of equipment and experiences to choose from. Cheap headsets that use mobile phones for gaming are nevertheless very popular at the low-end VR market and are purchased in more quantities as compared to other places in the world. Despite sudden drops in the VR market, China is continually experiencing VR hardware and content in a massive way. The quality may not be as good as the Vive or the Oculus but what China lacks in quality, it more than makes up for in quantity. VR games in China may vary from the jittery to smooth enough as the country’s VR game companies focus on making games for both the arcade market and personal use. In a nutshell, though what seems to be China's all out support and development for VR like the plans to build an entire city dependent on VR technology may look very ambitious and impractically unattainable (and which according to many western IT analyst would probably go bust in the near future), China no doubt has the market population, resources and technical ability to make its Virtual Reality plans a reality.